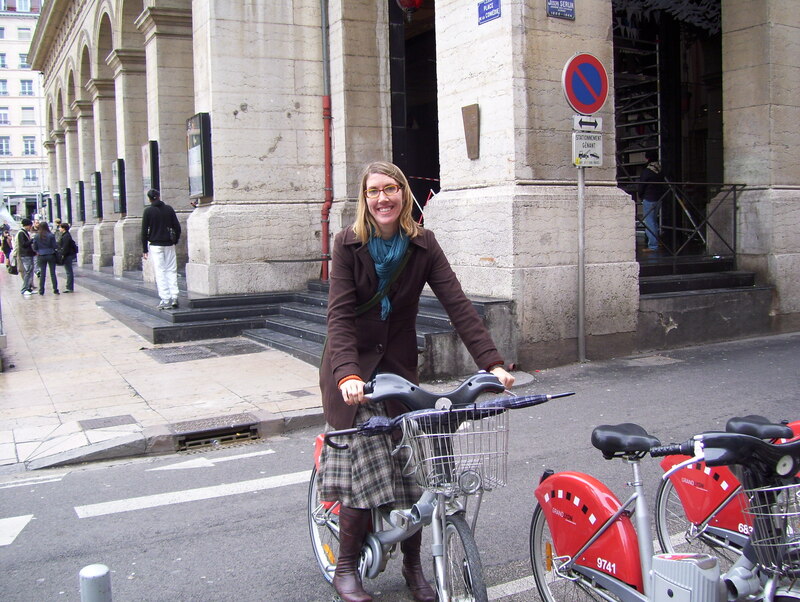 Before coming to Lyon, I was skeptical that bike-sharing could work in California – but I am becoming a convert. Lyon’s wildly-successful Velo’v program (pronounced Vell-LOVE, it means “bike love”) is putting a dent in driving without breaking the bank of the municipalities and residents. 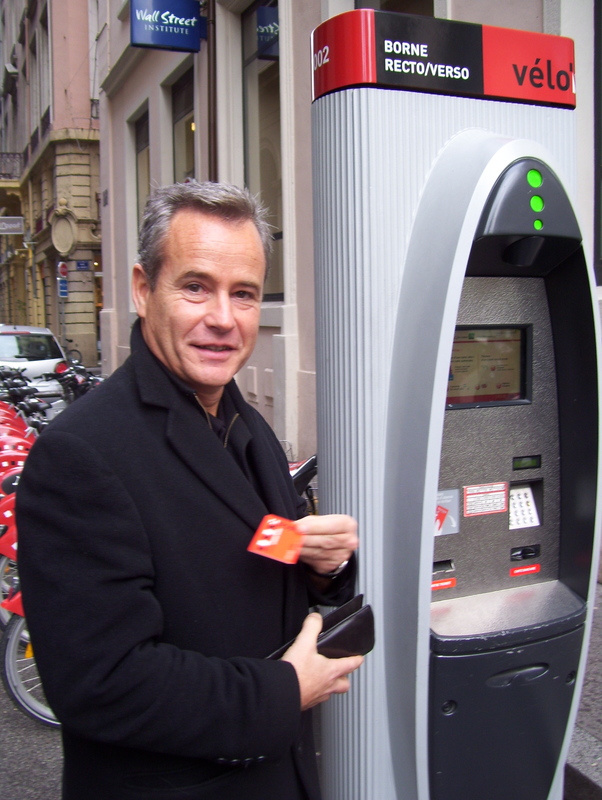 The mastermind behind the Velo’v program is Lyon City Council member Gilles Vesco. In France, many elected officials are in charge of a particular department or issue – a good idea, I think – and Gilles is responsible for urban mobility for the City of Lyon. He also serves as the Vice-President of Greater Lyon, the body that oversees regional transport and municipal planning for the larger metropolitan area. 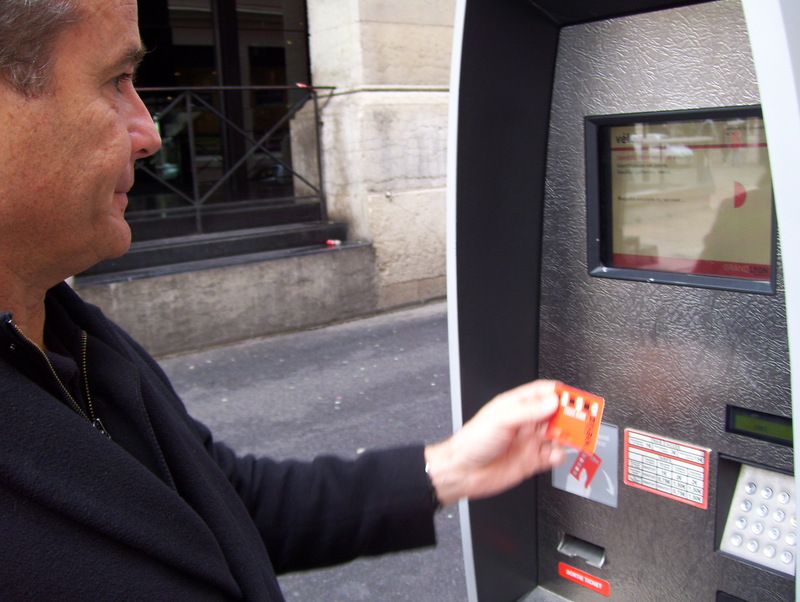 Gilles welcomed me to Lyon on my second day and showed me how the system works. Step 1: Wave your membership card in front of the sensor. (Non-members can use a credit card instead). Step 2: Enter your pin . . . what was it again? Step 3: Just like the vending machine. Decide which bike you want and enter the number of the post its attached to..
Viola! The bike is yours. Thanks Gilles! So that’s how it works for users. Behind the scenes, its a little more complex. Velo’v is run by a private company called JCDecaux that also manages Lyon’s bus and bike shelters – basically the street infrastructure for transport. (On a side note, I find it very interesting that most of Europe’s transport systems are operated by private companies rather than public agencies. Something to explore another time.) Around the time that JCDecaux’s contract was coming up for renewal, the City asked them to develop a pilot bikesharing program as part of their new contract. The company agreed. Velo’v launched in 2005 with 2,000 bikes and was an immediate success. Another 1,000 bikes were added a year later, and another 1,000 the year after that. Today, the big, sturdy bikes with the red bumper are ubiquitous throughout Lyon and neighboring Villeurbanne. There are 350 stations with almost 4,000 bikes (that’s one bike for every 150 residents). On an average day the Lyonnaise make approximately 20,000 trips using Velo’v. A colleague of Gilles told me that Velo’v was a “revolution” in Lyon, and I have to say I think he’s right. Every single person I’ve talked to in Lyon knows Velo’v and loves it. I’ve never seen so much enthusiasm for a local transport program. There’s even a video game called Velo’v racing in Lyon. There are now similar programs in other French cities and across Europe but as many proud locals have told me, Lyon did it first and became the model. 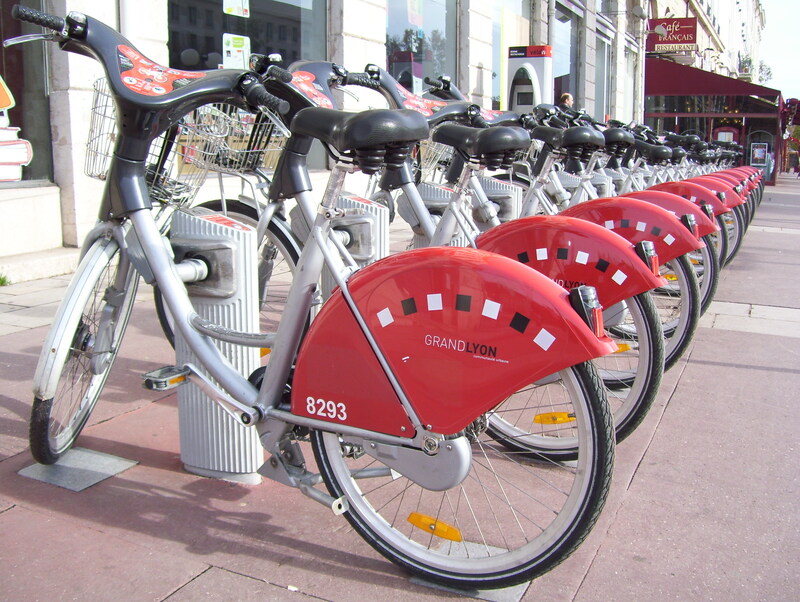 The Paris program, modeled on Lyon’s, is massive (16,000 bicycles) and is called Velib (bike liberty). My landlord Eduoard told me he loves to correct Parisians who visit Lyon and mistakenly assume that Paris did it first. But how much does it cost? 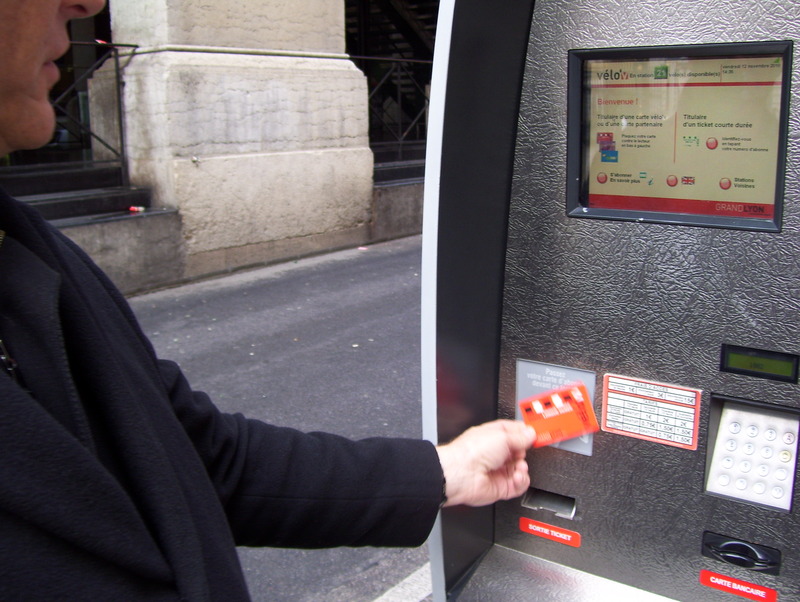 Amazingly, the program is basically cost neutral for the participating cities and relatively inexpensive for users. The first half hour is FREE and after that its 1.5 – 3 euros per hour (its cheaper if you have a membership). How is this possible? Because Velo’V is privately managed, the exact financial details aren’t public. But apparently the low cost of the program is offset by the company’s exclusive rights to advertising space on the bus shelters and other street infrastructure the company manages on behalf of the city. According to Gilles, the program’s biggest (and costliest) headache is also a key to its success. With Velo’V you can take a bike from any station and return it to any other station in the system. This flexibility makes it very appealing to users. On the other hand, it also makes for some big logistical nightmares. For example, on a sunny Saturday, all the bikes end up at the city’s main park. In one hilly district, everyone rides the bikes to the bottom of the hill, but no one wants to ride them back up. The administrators of the program have had to learn to anticipate these supply/demand imbalances and develop a system for re-distributing the bikes (via truck, I’m afraid). One of the most interesting things about Velo’v is its ripple effect on bicycling in Lyon. Before Velo’v only about 1% of local trips were taken by bike. But after Velo’v, more and more Lyon residents began riding their own bikes. Local transport researcher Marc Ellenberg told me that for every 1000 bicycles that Velo’v added to the streets of Lyon, private residents have added 2000 bicycles. Why would people start riding their own bikes after a bike-sharing program started? Cycling became cool. Gilles and others told me that Velo’v helped lessen the social stigma of riding a bike. Yes, even in cycle-happy France there is a stigma associated with riding a bike. (Cycling for sport ala Tour de France is distinguished from cycling for transport). The lemming effect. Personally, I always feel safer when there’s other cyclists around, for rational and irrational reasons. Maybe the Lyonnaise do too. The upgrade effect. Perhaps people tried Velo’v and liked it so much that they decided to invest in a bike that fits them better. The Velo’v bikes are – by necessity – heavy, slow and one-size-fits-all. Whatever the reason, this magnifying effect of Velo’v has had a pronounced impact on travel in the city. Before Velo’v, 1% of daily trips were made by bicycle. In the five years since the program began, that number has tripled to 3%. Considering that the program is essentially revenue neutral for the municipalities involved, that’s a pretty good cost-benefit ratio. Currently the program only exists in Lyon and Villeurbane. But after witnessing the program’s success, the regional government Grand Lyon has made it a top priority to expand cycling throughout the region. Their goal: 7.5% bicycle mode share by 2020. In addition to the expansion of Velo’v, the plan calls for the expansion of the bicycle network (600 km of new bike lanes by 2020) and a new long-term bike “leasing” program for students and low-income residents. Could bike sharing work in California? A handful of California communities and universities have created bike sharing programs but their scale is generally quite small and, importantly, they are centralized – ie you have to return the bike to the same location where you got it. If Gilles is correct and the decentralized, one-way model is a key to success, then we would need to make a bigger upfront commitment. Could SB 375’s regional framework create the opportunity to do a large-scale program like Lyon’s? You can read more about Velo’v on its english-language website. im impressed. i could see where large urban cities would get these, but urban people would continue to use their cars and have no interest. I like to think you were a trend setter on this one!